Boxing is a martial art and combat sport between two peoples. Especially Muhammad Ali’s life is very inspirational story of modern times. He was a boxer, a poet and a true symbol for the young generation. “ THE MAN WHO BELIEVES REAL SUCCESS COMES WHEN WE RISE AFTER WE FALL ” stated by President Barack Obama for Muhammad Ali. He was an American Olympic and legendary boxer and greatest sporting figures of the 20th century. He began his training when he was 12 years by recognizing his ability towards boxing. 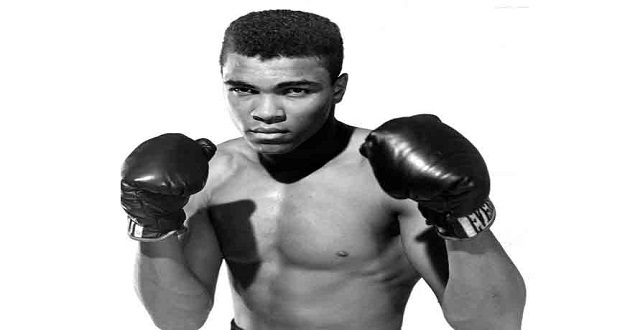 Following are some interesting facts of Muhammad Ali which will definitely like by his fans. As his beloved bicycle was stolen, he went to police officer, Mr. Joe Martin for complaining and told him to beat that thief and in return Martin suggested him first learn how to fight and Ali started working with Martin -the police officer who was training young boxers at a local gym, how to spar and soon began his boxing career. At the age of 18, he won the Light Heavyweight gold medal in Summer Olympics in Rome in 1960 and at 22, he won the WBC and WBA heavyweight championships from Sonny Liston in an upset in 1964. He was originally named in honor of a white abolitionist. That name, Muhammad Ali, was bestowed on March 6, 1964 after the reporters that he had renounced his surname, which he called his “slave name,” and would be known as “Cassius X” until Nation of Islam leader Elijah Muhammad gave him a holy name. Ali refused to serve in the U.S. military for religious reasons. The heavyweight champion was arrested, and the New York State Athletic Commission immediately suspended his boxing license and stripped him of his title and Ali had fined $10,000 and was banned for 3 years from boxing. One incident took place in his life that in 1960, Rome Olympics when Muhammad Ali flew to Europe he was so scared on the air that he insisted on wearing a parachute in the plane as he was scared of flying. At last, an anonymous buyer purchased the gloves which Ali wore to defeat Liston in the seventh-round technical knockout for $836,000 and Ali earned only $630,000 for the victory itself.